Hey everyone! I am hosting a challenge over at Two Peas In A Bucket this week and I'd love for you to take a peek and play along. I don't know about you but my boys' Halloween costumes never seem to fall into the traditional black, purple, and orange color categories that are typical of the many Halloween collections available. Instead we seem to have lots of Spongebob yellow, Spiderman red, and Luigi green! ;) However, being the matchy matchy kinda gal that I am, I like my scrapbook products to match the colors of the photos I'm using. So what's a matchy matchy kinda gal like myself to do? Of course one option is to simply change my photos to black & white, but there are those instances when I really want to keep my photos in color. So to accomplish this on my layout I simply choose products that represent the colors of my photos. There's no rule that says Halloween layouts must use Halloween colors or products. 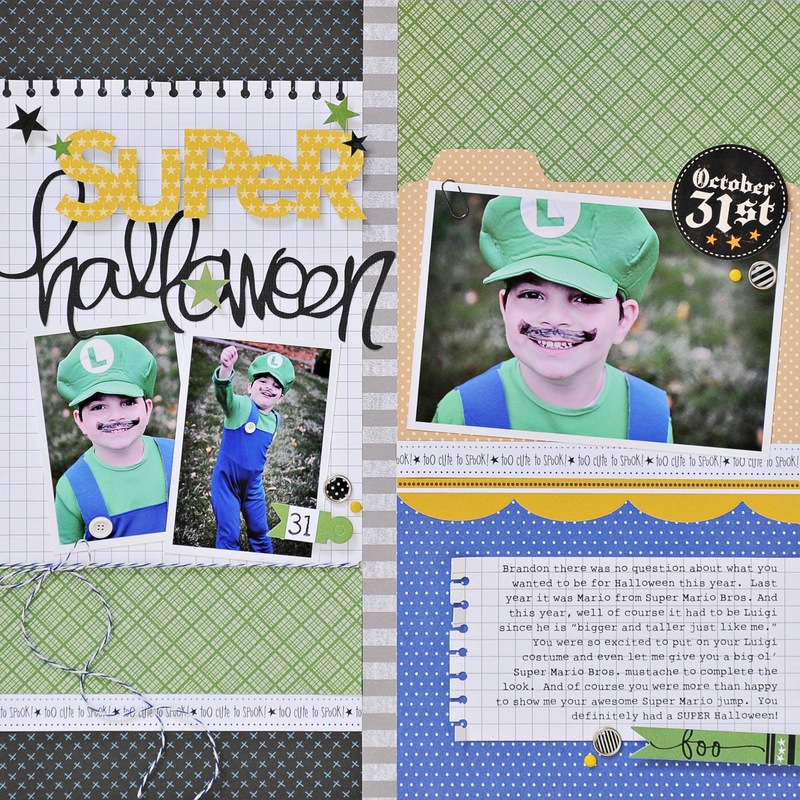 You can see in my layout below that I was still able to give my layout a Halloween feel through my title and my embellishments, but the "super" colors of my son's adorable Luigi costume definitely shine through. 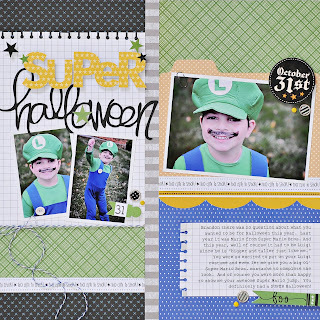 I just LOVE these pictures of Brandon dressed up as Luigi from Super Mario Bros. last year. 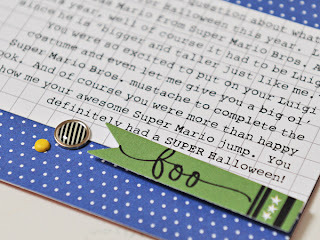 And boy was he proud to show off his awesome Luigi jump - "oh yeah!" - and super cute mustache. The colors in these photos were just fantastic I couldn't bear the thought of turning them black and white. So I simply embraced the colors and chose products that really highlighted my photos. I die cut my title using my trusty Silhouette. 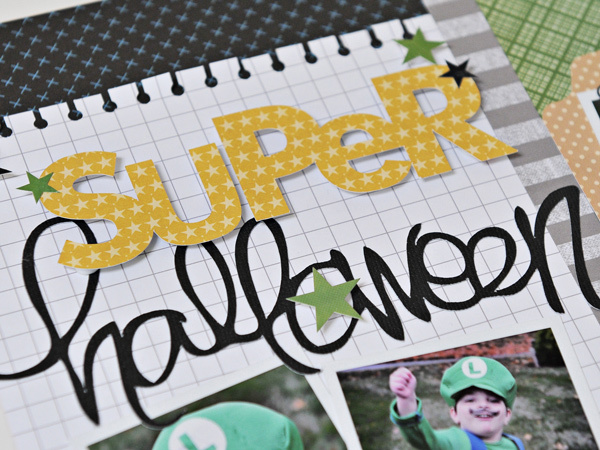 There was no specific cut that said "Super Halloween" so I just mixed and matched two different cuts for the title I wanted. I popped up the "super" with some foam adhesive for even more dimension and added lots of star stickers for detail. I used an Ali Edwards for Technique Tuesday stamp to stamp the word "boo" on this sticker flag by Bella Blvd and added some fun brads below my journaling. Another sticker (this time one that actually IS Halloween themed) and a few more brads added to the white space of my main photo help create a visual triangle and move the eye around my page. So there you have it. 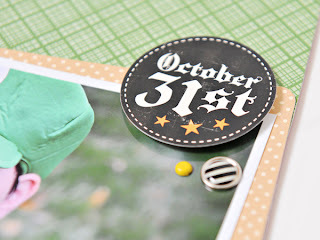 A decidedly Halloween layout using non-traditional Halloween colors. If you'd like to play along with this challenge for a chance to win a $5 Gift Card to the Two Peas store check out all the details here! Happy Haunting!